You likely already know the famous Hatfield & McCoy feud across West Virginia and Kentucky. And, the area has capitalized on this theme for their tourism efforts (smart!). One Gilbert distillery has gotten in touch with its roots to create "The Drink of the Devil." Hatfield & McCoy Moonshine is sure to put the warmth of the devil in ya. 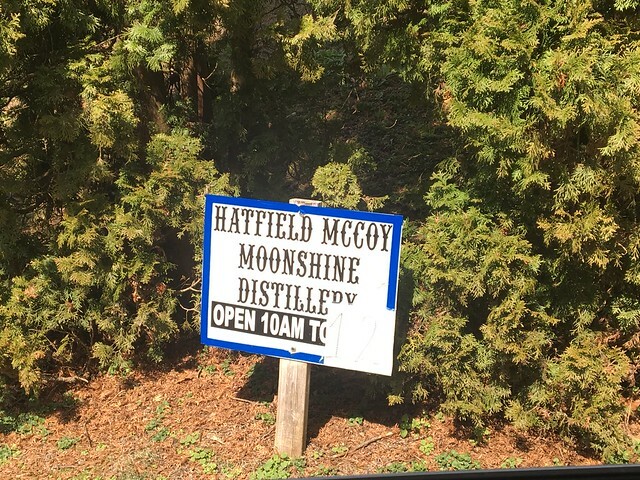 Experience a slice of history with a behind the scenes tour of the Hatfield & McCoy Moonshine distillery. 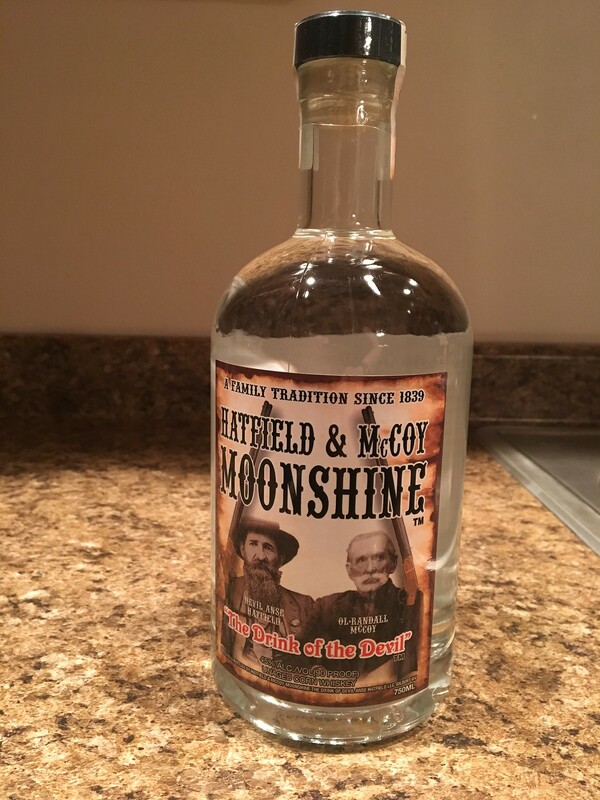 Hatfield & McCoy Moonshine is the very first authentic mountain moonshine ever legally produced by the Hatfields and McCoys. Situated in the southern mountains of Gilbert, West Virginia, this moonshine has been hand made following a family tradition passed down for generations. I made my way to this distillery (the GPS takes you up this one-lane road and doesn't quite connect you there so just be on the lookout for signs once you get into Gilbert. I actually drove about 20 miles out of the way until I got cell phone service to call them and then made my way back. I was determined). 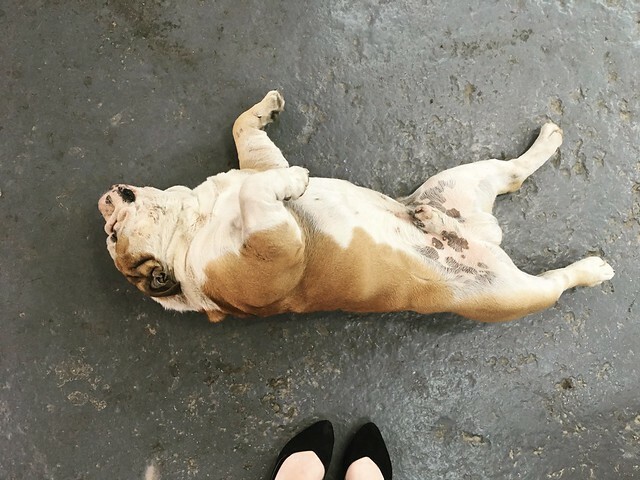 When I was there, I'm pretty sure I took more photos, but the only one I kept somehow was this cute little guy who followed me into the building. Either way, I did a quick tasting with the owner, whose family is a descendent of the Hatfield family and got a bottle to go. Strong stuff, but the perfect component for drinks. Handed down for generations, the recipe used to make Hatfield & McCoy Moonshine is as authentic and original as the mountains and streams that bear the family names. The original recipe belongs to Devil Anse Hatfield and is currently produced in small, handmade batches, six days a week, in the micro-distillery in Gilbert, West Virginia, on original Hatfield land. Simply said, there is moonshine and then there is real authentic moonshine. You cannot mass produce moonshine and keep the tradition and quality of the small batch craft moonshine. With one taste, the “old timers” will tell you Hatfield & McCoy Moonshine is second to none. Hatfield & McCoy Moonshine is a premium white corn whiskey that is hand crafted from 100% West Virginia grown corn, carefully fermented, and then distilled in copper kettle stills in small batches using the same authentic proprietary recipe handed down for over 150 years. At 90 proof, our all natural, gluten-free family recipe will go down smooth but kick like a mule. Bold yet versatile, it can be enjoyed neat, chilled, or in a wide variety of mixed cocktails instead of vodka or tequila (ABOUT). Have you had a chance to go check it out? The facility seems lovely, and I'll have to keep an eye out to see if they host events here. Until then, here's some more background in case you need more convincing to grab a piece of this state's history. Hatfield & McCoy Moonshine is the very first authentic mountain moonshine ever legally produced by the Hatfields and McCoys. This moonshine has been handmade following family tradition passed down for generations. With a taste as original as its name, our moonshine is home fermented, home-distilled, and home bottled in small batches in our distillery located in the southern mountains of Gilbert, West Virginia. The Hatfield-McCoy feud began in 1875 between rival families of Devil Anse Hatfield and Ol' Randall McCoy. The story of “The Feud,” now over 135 years old, has become a modern American symbol of the perils of family honor, pride, justice, and vengeance. The most notorious family feud in American history involved the Hatfields of West Virginia and the McCoys of Kentucky. During the American Civil War, the feud leaders from both families were staunchly pro-Confederate, and Randolph himself served in the Confederate Army during the opening years of the war. However, Randolph’s younger brother, Asa Harmon McCoy, enlisted in the Union Army. He was discharged from the Union Army on December 24, 1864 after suffering a broken leg, and returned home. Soon after his return, Jim Vance, uncle of Devil Anse Hatfield, and a member of the "Logan Wildcats" (a Confederate home guard organized by Hatfield) put Asa Harmon on notice that the Wildcats would soon be paying him, "a visit." Asa Harmon McCoy tried to escape by hiding out in a local cave, but was tracked to his hideout and killed. No charges were ever filed but it was widely known that Vance and members of Hatfield’s Wildcats were directly responsible for his death. In the late 1870s, Devil Anse Hatfield was involved in a land dispute with Randolph McCoy’s cousin, Perry Cline over a 5,000-acre tract of land that both held title to. Hatfield brought a civil suit against Cline. Hatfield won in what was seen by the McCoys as a Hatfield friendly court. Perry Cline's relationship to the McCoys was through marriage. He had four siblings married to McCoys. Most importantly, his sister, Martha "Patty" Cline was married to Asa Harmon McCoy. Asa Harmon was killed in 1865, by Devil Anse’s uncle, Jim Vance. In 1886, Martha and Harmon’s son, Lewis Jefferson "Jeff", was killed by Cap Hatfield. In the fall of 1878, Randolph "Randall" McCoy brought charges against Floyd Hatfield for stealing one of his hogs. This allegation was a very serious offense at the time, as hogs were extremely valuable to the farming economy. Due to the statements made by Bill Staton, who was related to both families, the case was decided in favor of the Hatfields. The ruling further inflamed the feud, as Randolph McCoy viewed the outcome as unfair. Later, brothers Sam and Paris McCoy were accused, tried, and acquitted of the death of Staton when the judge ruled Staton’s death an act of self-defense by the McCoy brothers. Randolph's daughter Roseanna McCoy entered a relationship with Devil Anse's son "Johnse" Hatfield and later became pregnant with Johnse’s child. Upon learning of the affair, Randolph became extremely upset and disowned her. Roseanna, unwanted by both families, moved in with her aunt Betty Blankenship. Johnse later married Roseanna’s cousin, Nancy McCoy. Roseanna’s baby died before her first birthday and the abandoned Roseanna died at the age of 28. The peak of the feuding occurred when three of Randolph’s sons (Roseanna’s brothers) killed Ellison Hatfield, brother of Devil Anse, on election day in 1882. The McCoy brothers were arrested and taken for trial, but Devil Anse organized a large group of followers and intercepted them. Devil Anse retaliated for the killing of his brother by executing Tolbert, Pharmer, and Randolph Jr. without trial. It was January 1, 1888. Randolph’s house was burned to the ground and numerous family members were slain by the Hatfields, including two of Randolph’s children. His son Calvin was killed in the shootout as was his daughter, Alifair, who was shot to death as she tried to flee the burning house. Randolph’s wife Sally was badly injured when she attempted to comfort Alifair, suffering several broken ribs and skull fractures. With his house burning, Randolph and his remaining family members were able to escape to the woods; unfortunately, his children, unprepared for the elements, suffered frostbite. He moved his family to Pikeville, Kentucky, where he lived out the remainder of his life in bitterness and grieving. He operated a ferry in Pikeville for some time. By the end of the feud, he had lost seven of his children and his wife. Shortly after the New Year’s massacre, Kentucky deputy Frank Phillips and a posse of McCoys chased down Jim Vance and Cap Hatfield, killing Vance. Phillips’ posse rounded up nine Hatfield family members and supporters and hauled them off to jail. The feuding and warfare brought in political leaders of Kentucky and West Virginia. The Governor of West Virginia, E. Willis Wilson, accused Kentucky of violating the extradition process and appealed the matter to the Supreme Court of the United States. Kentucky Governor Simon Bolivar Buckner sent his Adjutant General to Pike County to investigate the situation. In May 1889, the Supreme Court decided against West Virginia (Mahon v. Justice); the nine Hatfields would be tried in Pikeville. Private detectives hunted down many Hatfields, though Devil Anse was never tried nor jailed. In 1890, Ellison Mounts was executed in Kentucky for his part in the McCoy killings. He was one of the men captured along with Mahon. The feud started to wind down with Mounts’ execution.